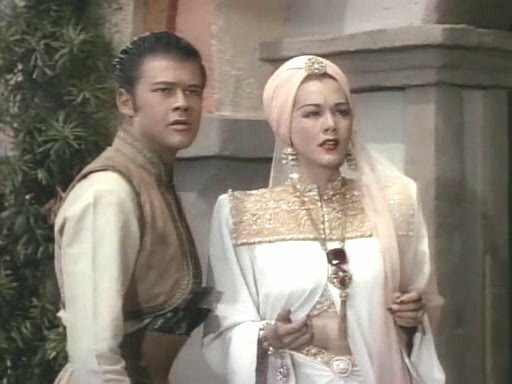 A limp rehash of the Jon Hall/Maria Montez Arabian Nights movie that Universal released the year before. Hall plays the rightful ruler of Baghdad in both who is trying to regain the throne from some pretender, Maria Montez is the acting-challenged red head posing as an exotic beauty who really loves Hall’s character but is being forced to marry the usurper in both, and at some point in each movie the lovebirds have mistaken identity problems which allows the director to drag out the story before the mistake is discovered. 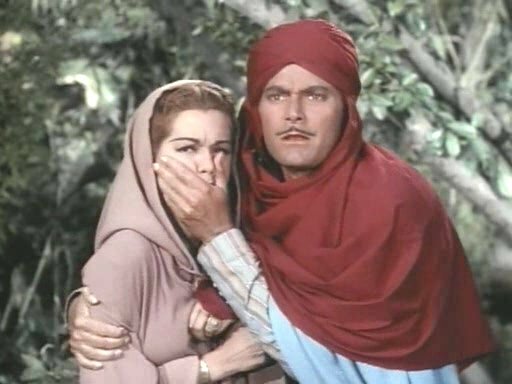 Ali Baba though fails to capture any of the fun of Arabian Nights because Ali Baba eliminates almost all of the humor, reduces the supporting cast to bland villains and wannabe matinee idols like Turhan Bey and gives Maria Montez a lot more screen time. If you really didn’t notice had bad she was in Arabian Nights because of everything else going on, you will in this one where she spits out her lines like she has too much sand in her crop top. Baghdad is once again under siege, this time from the Mongol hordes. This allows us to have a main villain who looks like he’s trying to channel Ming the Merciless’ little non-threatening brother. The Caliph is counseled by his adviser Cassim that he should work out a deal with the Mongols to give up Baghdad and get a swanky set up in the country instead. The Caliph just looks at this guy like a camel farted in his face and says that he’s no pansy and they’re all going to battle the Mongols once and for all, but first they need to stop at Cassim’s house to pick up the Caliph’s son, Ali. Meanwhile, back at Cassim’s country estate, young Ali and Cassim’s daughter Amara are busy giving each other HIV by cutting themselves and rubbing their bloody cuts together. Somehow this questionable activity is a sign that they are betrothed to each other (each has the blood of the other flowing inside of them), which is a good thing, since it wouldn’t be right if they went and knowingly infected some third party. Cassim doublecrosses the Caliph and the Mongols are waiting. Everyone is killed, but Ali escapes having seen Cassim’s treachery. Ali wanders the mean deserts of Arabia and happens upon a band of thieves leaving their secret hideout. He watches and figures out the command to open the secret door into the mountain. Once he’s discovered, the head of the thieves, Old Baba, decides that they need a pesky kid to take along on their raids and calls him Ali Baba. They know by the medallion he wears that he is the rightful ruler and Old Baba assigns the rotund (read: comic relief) Abdullah to watch over him. Ten years quickly pass and Jon Hall finally shows up on set fresh from the tanning booth in the role of the grown-up Ali. He has acquired everything you would expect from an adult guy named Ali Baba, including slicked back hair and pencil thin mustache. The Mongol ruler (Khan) is still in control over Baghdad and being assisted by Cassim. And by assisting him, I mean he’s providing his daughter, Amara, to him for a bride. He hopes that this will solidify his standing in the Mongol’s court and whines incessantly to his daughter about how much her wedding to the Mongol will mean to him if she’ll just go along in spite of how icky Khan is. Amara and Ali run into one another for the first time in years when he’s scouting out her wedding train to see if it’s just a big stinky trap. It is of course and Ali is locked up in a cage and hauled back to Baghdad to be executed. A jailbreak and wedding riot follow in the best Baghdad tradition. 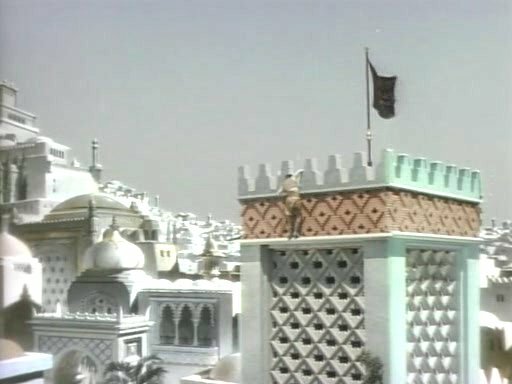 This movie goes through the motions in its ill-advised attempt to mimic Arabian Nights which while fun, wasn’t really great. Without the supporting cast of the first film (Sabu, Billy Gilbert, Shemp Howard), it’s up to Hall and Montez as well as the villains to carry the movie. Hall is inoffensive in his blandness, needing someone colorful like Sabu to play off of (not the tanner yet also bland Turhan Bey), Montez is just hideous, conveying nothing other than a off-putting haughty demeanor and is unconvincing as anything other than a heavily made-up trollop. Some of the sets are okay (except for the ones that looked like left overs from the last movie) and there’s a lot of riding around on horses and some swordplay, but what’s missing is the camaraderie of the gang that they had in the first movie. 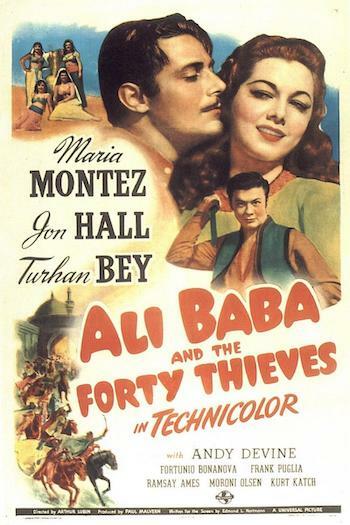 Of the forty thieves, no one other than Abdullah had a distinct personality. That’s probably just what you would expect from a movie that didn’t have one of its own either.